(meeting / training, remuneration travel, academic / international conferences, exhibitions). for those purposes with real Japanese traditional arts. from planning to venue arrangements, preparation of meals, etc. By using our service to your customers, you will be able to have contacts with wealthy people and VIP customers that you have not acquired. In fact, there are many companies cooperating with us that have succeeded in incorporating the wealthy people. As one of your new services, you can use Motenas Japan’s traditional arts. It will be surely your company's strength to appreciate private traditional arts that cannot be imitated by other companies. Our service is fully open price. By adding features of your company to Motenas Japan, you can offer high additional value services and adjust the price range. Please conrtact us directly for more details. Some customers expand the length of stay in Japan to see Japanese traditional arts. We are pleased with our customers because of valuable content that Japanese people cannot experience. Some customers who used our service in the past like Japanese traditional arts appreciation and used our service repeatedly. Please use our service to acquire repeat customers. You can use our service to acquire inbound and wealth customers who seek special experiences. Please use our service for new market exploitation. Foreign visitors are distressed by the way of spending the night time. Especially the Westerns, they look forward to night entertainment. In Japan, they hardly find places to enjoy in the night except for eating places like pubs. Therefore, by using Motenas Japan窶冱 service for foreign customers, it is possible to improve customer satisfaction and attract customers. In a training trip by a European automaker, we showed off samurai, tengu, and hyottoko(masked clown). Although it was a tour of more than a hundred people, we arranged multiple actors in order to maximize the service of Motenas Japan, which put importance of making a private space. We made it possible for every customer to have a realistic viewing experience. As a result, they got very satisfied with the show. When a European luxury brand VIP customer group tour came, we received a request, “We want you to perform the performances at two venues due to the number of people”. 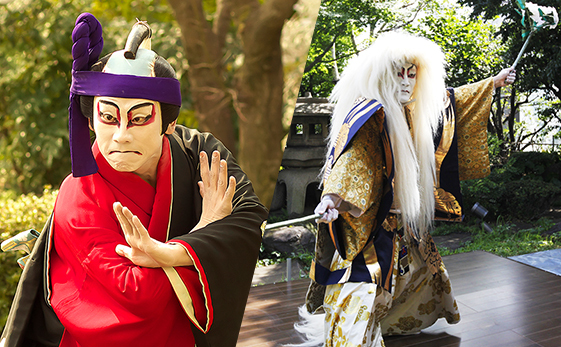 We, Motenas Japan, organized the venue and arranged a meeting with the actors consistently and made it possible to perform the Kabuki performance at the same time at two venues. 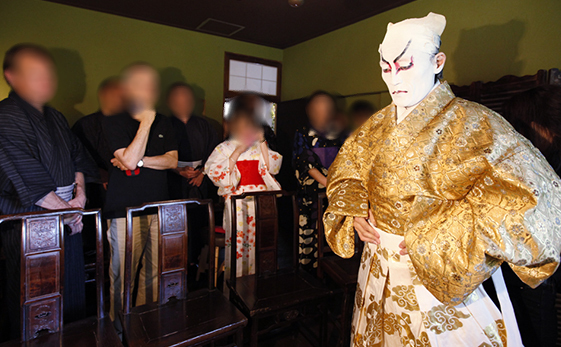 The tour planning staffs commented, "We are very proud that we were able to see Japanese traditional arts, kabuki, in private at the same time at two venues, as it was declined when inquiring to other companies”.